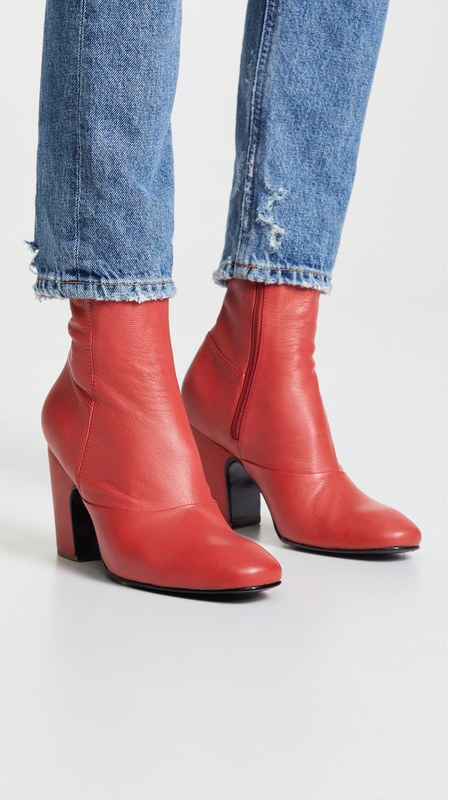 What is it about red booties that is suddenly so appealing to me? Not sure, but I do think these are stellar. Here’s something similar but cheaper. 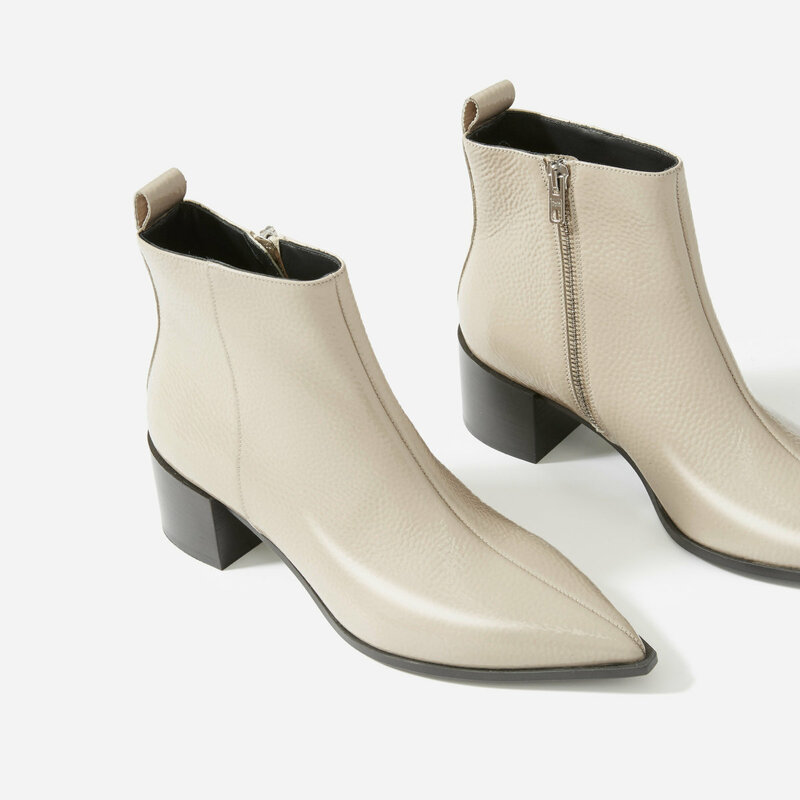 And I’m kind of into the notion of white booties too, and think these, from Everlane, are pretty sharp. 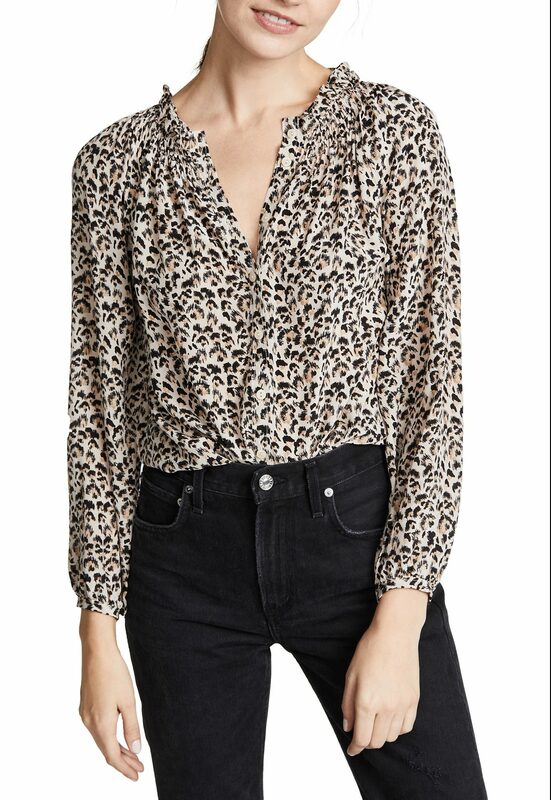 I could see wearing this sweetly feminine leopard print blouse with skinny black trousers. 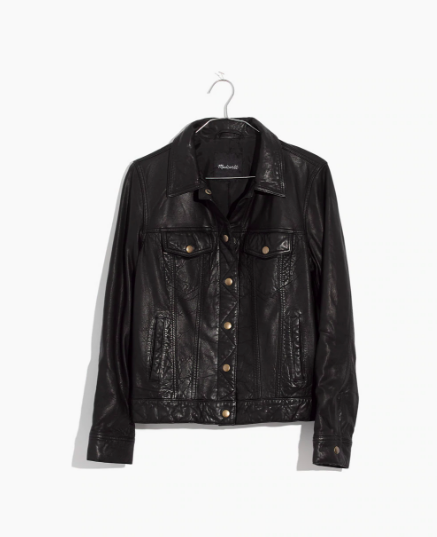 There’s something kind of appealingly 90s about a leather jean jacket. 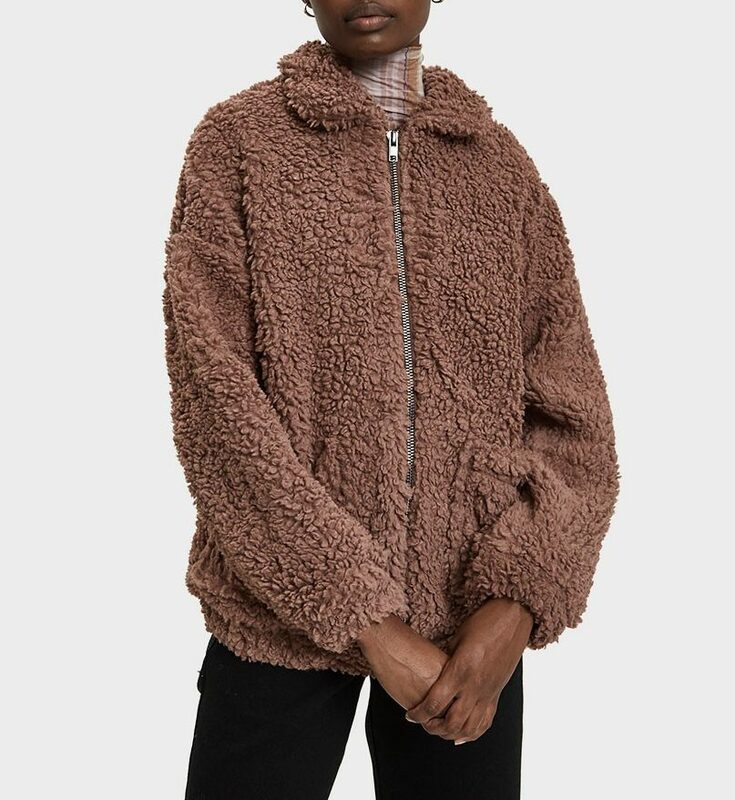 And I am forever a sucker for a good faux fur jacket, and this one is so lovely: nice and fluffy and well-cut. I like black jeans, but not when they’re pitch black, and these have more of a charcoal-y hue. I also appreciate that they’re not high-waisted. I love the nubby texture of this jacket, and it’s pretty well-priced. I like kicking around in sneakers, but I hate taking a hit on height with my footwear. This pair has a platform sole that’s subtler than most platform sneakers. 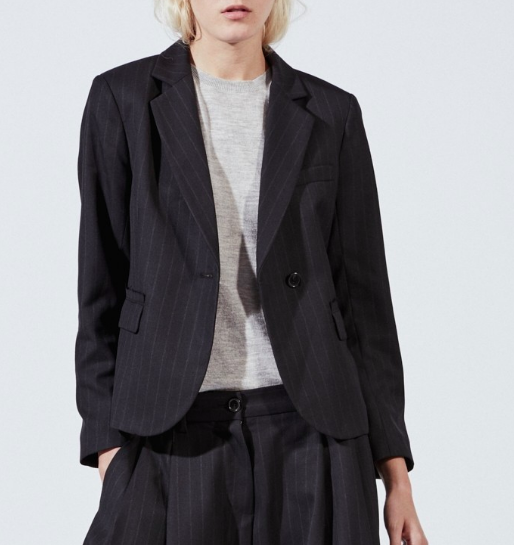 I want this perfect pinstriped blazer so badly I could cry: first of all because the pinstripes are so spiff and would dress up jeans and a tee beautifully, but also because it’s a nice shrunken-but-not-too-shrunken shape. 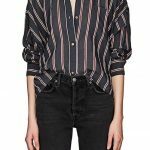 I like neither turtlenecks nor wide sleeves, and yet something about this top appeals. These red booties are just stunning. Smart move! You can find good buttons, easy peasy! I guess there is no way, but I’d love to see a photo of the blazer. It sounds cute. Very cute!! Thanks for the link! If you want something so bad you could cry, you should get it. Buy that blazer! 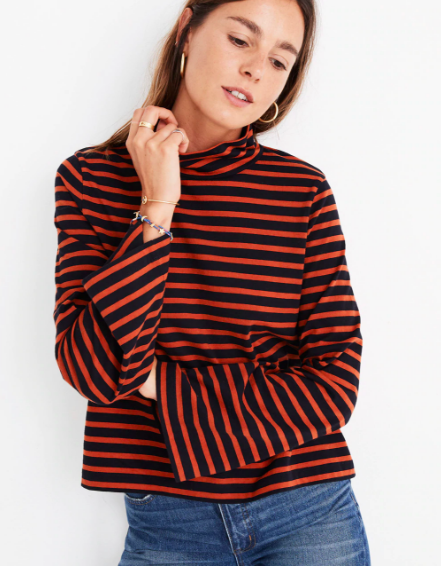 Perhaps the appeal of the wide sleeved turtleneck is actually the model? She models for my usual online haunts: Madewell, Sezanne, Everlane and I have noticed that I want to order everything she wears. She is so beautiful and looks comfortable, effortless in her clothes — clearly she is VERY good at her job because she has sold me a lot of clothes! Perhaps the appeal of the wide sleeved turtleneck is actually the model? She models for my usual online haunts: Madewell, Sezanne, Everlane and I have noticed that I want to order everything she wears. She is so beautiful and looks comfortable, effortless in her clothes -- clearly she is VERY good at her job because she has sold me a lot of clothes! Loving the blazer too. Looks beautiful and not too constrictive. I’m really into red booties right now, too, Kim. I call it “The Anine Bing Factor,” since it started for me when I first began following her on her website and saw the cutest booties in a multitude of colors – but she was wearing red, and let’s face it, she’s the best brand ambassador for her own stuff. I’ve held off so far, but they may turn into a Christmas request! I’m really into red booties right now, too, Kim. I call it “The Anine Bing Factor,” since it started for me when I first began following her on her website and saw the cutest booties in a multitude of colors - but she was wearing red, and let’s face it, she’s the best brand ambassador for her own stuff. I’ve held off so far, but they may turn into a Christmas request! Birkenstock boots? How did I miss those? What day was that? Wow, I will have to go back and look at those. I’m in my can’t-order-anything phase of my east coast stay since I head back to Texas soon and I don’t want to risk any orders arriving here when I’m there. 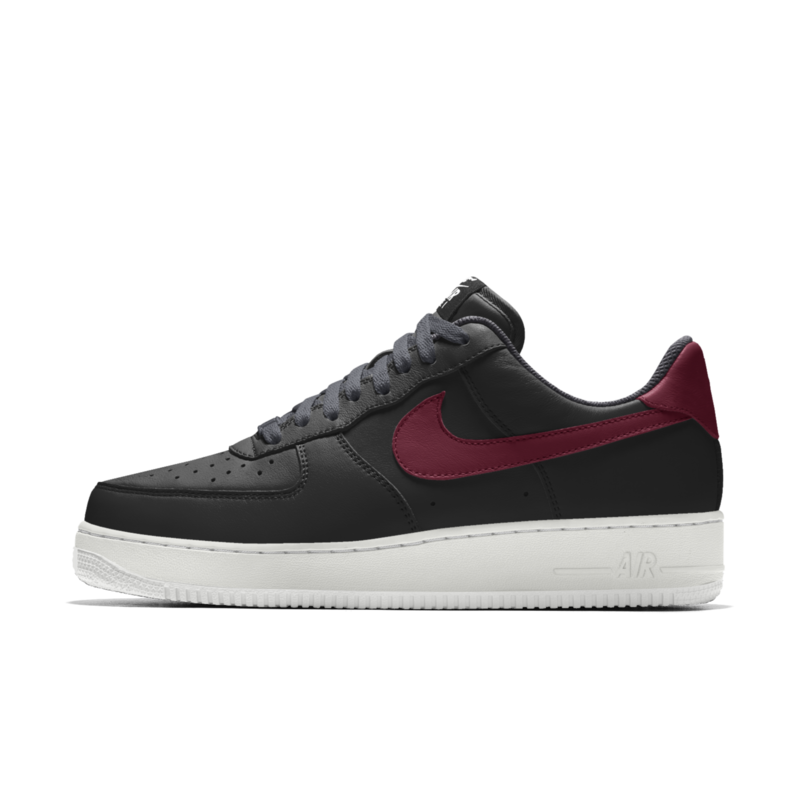 However, if I were ordering it would be the sneaks––love the subtle platform!–– and the turtleneck, but NOT in the Halloween black and orange stripes, but the ivory combo instead. I'm in my can't-order-anything phase of my east coast stay since I head back to Texas soon and I don't want to risk any orders arriving here when I'm there. However, if I were ordering it would be the sneaks––love the subtle platform!–– and the turtleneck, but NOT in the Halloween black and orange stripes, but the ivory combo instead. 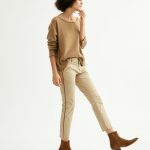 I have seen that Madewell turtleneck (in ivory) both on campus and at my 40th HS reunion, so I think it has wide appeal!